A Very Bert Dax Christmas, Volume Eight is now available here at PancakeProductions.net--click the image below to order for $6.50 (postage paid)--or in Saint Louis record stores such as Vintage Vinyl, Euclid Records, and Apop Records. You probably won't get it delivered to your door, or with a bunch of free goodies, if you buy it anywhere besides right here, though. Read more about PP 006 below the image. M.S.I.F. - "Protect Your Presents"
Glass Teeth - "Happy New Year"
Trigger 5 - "X-Mas With My Exes"
Popular Mechanics - "364 Days A Year"
The Union Electric - "Jack Frost Is Innocent"
Humdrum - "Me And Santa Claus"
Johnny Vega$ - "Do They Know It's Christmas In A Drunken Ukulele Style?" 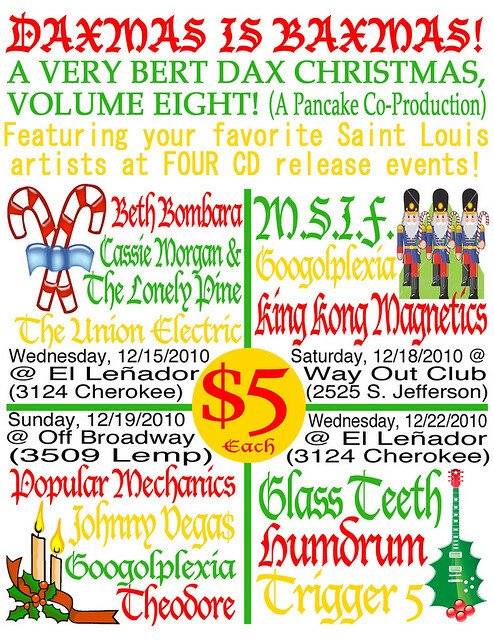 In MMX (2010) I convinced my good buddy Matt Harnish to bring back his perennial Saint-Louis-based Xmas-themed compilation, A Very Bert Dax Christmas He had taken the previous year off due to obligations and general busy-ness with his band, his other label (the one that's not The Bert Dax Cavalcade Of Stars), and who-knows-what-else, but with the help of Pancake Productions, a legend was reborn. As I liked to say at the time, "Daxmas Is Baxmas!" We were each responsible for getting about half of the tracks together. We had four successful release shows where all 11 acts featured on the disc performed over a period of eight days (total, including days in between). Eight days of Daxmas--how perfect. Googolplexia provided bill-filler for the concerts that didn't have quite enough acts to make up an entire bill. I was also lucky enough to get the privilege of providing some Farfisa accompaniment for the Popular Mechanics track! Dang, doing some internetting just now I realized the Cassie Morgan song has an associated music video!